The Nylons have taken a cappella (vocal only) music to an audience weaned on overproduced, over-arranged Top 40  and sold it to them. Even more than the jazzier Manhattan Transfer, The Nylons have managed to get precious radio airplay. Their secret to success is their willingness to cover old Top 40 hits familiar to a large audience, from rhythm and blues tunes like "Up On the Roof" (albeit made into a hit by James Taylor), "The Lion Sleeps Tonight" and "Chain Gang" to pop-rock numbers like the cover track. The magic present in their first two albums is even stronger here. The addition of some background percussion, first added on the last album, "Seamless," continues to integrate with and contribute to their overall sound, adding depth and richness. The melodies on "Happy Together" are sweeping, the harmonies rich like an imported chocolate with a liqueur center. 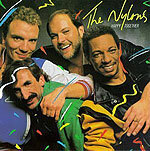 The Nylons have achieved a rare synthesis  "feel good" music with soul. Original numbers keep getting better, too. "This Island Earth" is a jamming number, as catchy as any of the covers. This is the good stuff, and a wise use of your money.